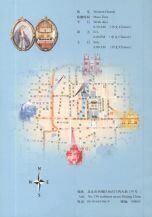 Xi Zhi Men Church - the folder with inside mass times, a map, and a small history of the church. Xi Shi Ku Church (North Church or Bei Tang), the former Jesuits Western Cathedral lies hidden away in the green streets of XiCheng District. The Church is easily found when moving West from the Forbidden City North Gate (ShenwuMen), past the circular city and the souther edges of Beihai Park, across the bridge (between NanHai and BeiHai) along Wenjin Jie. After passing the Former (Imperial) Beijing Library, walk onto Xi'An Men Dajie and get sight of the Northern Church facade in the north-west direction before hitting the crossroads of Xi'AnMen Dajie and FuxingMen Nei Dajie (FuxingMen Inner Street). If you are at the Geological Museum you have gone too far and should return on your footsteps. The Northern Church stands just North off Xi'AnMen Dajie at the end of an unexpectedly small side-street. Visit the Eastern Church just North of famed Wanfujing, Beijing's number one shopping street. 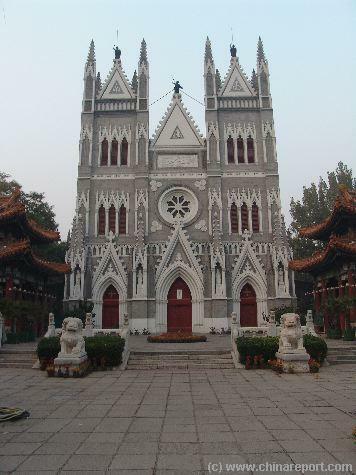 Thus also dubbed "Wanfujing Cathedral", the east church is one of the most visible Christian landmarks in the City and a remnant of European influences established under the Portugese as early as the Yongle reign of the Ming Dynasty. A blissful retreat after a walk through always bustling Wanfujing with it's consumer crowds, the Church and it's small parklike grounds are a great place to have a rest. It is also a popular spot for wedding photos, local singing or musical groups, and last but not least - lovers come here for cozy moments. In the evenings local skaters use the marble platforms for practice, always good for some fun action. Address: No. 130 XizhiMen Nei Street, XiCheng District of Beijing , PC 100005, China. both wider and longer. In addition a small Bishop's house, a seminary and a children's orphanage were constructed inside the new Church grounds, making North Church the largest Church in the City of Beijing. All of the original structures remain today. View Inside the Gate of the Northern Church. A small but Calm and quiet Park reveals the Portugese styled facade of the Church. Facade of the Northern Church clearly reminiscant of Portugese styled churches in former "Treaty Ports" (Colonies) Macau and Hong Kong. Beijing's First Jesuit Bishop was the Father Matheo Ricci, from Portugese Ancestry. The small and rather modest bishops house dating from 1887/88 AD. It has been the home of many of the Beijing Bishops since. remained but one Church in Beijing. This was the South Cathedral, Nan Tang, which had been awarded previously during the times of father Matteo Ricci at court. During the Kangxi Reign (1661 AD - 1722 AD) father Verbiest managed to build forth upon this enormous succes, as had his predecessor Schall von Bell. For over a century the North Church and its flock flourished. However, in 1827 AD, in tensions that would eventually lead to the Opium Wars with Britain, the DaoGuang Emperor (Reign 1820 AD - 1850 AD) took a number of assertive measures in hope to safeguard China from western encroachment. His actions included an attempted halt on the opium trade and measures against the politically subersive activities of traveling western priests, the so-called "Missionaries". A severe anti-opium program against foreign traders in Canton (Guangzhou) was launched, seizing and destroying 20.000 chests of Opium. 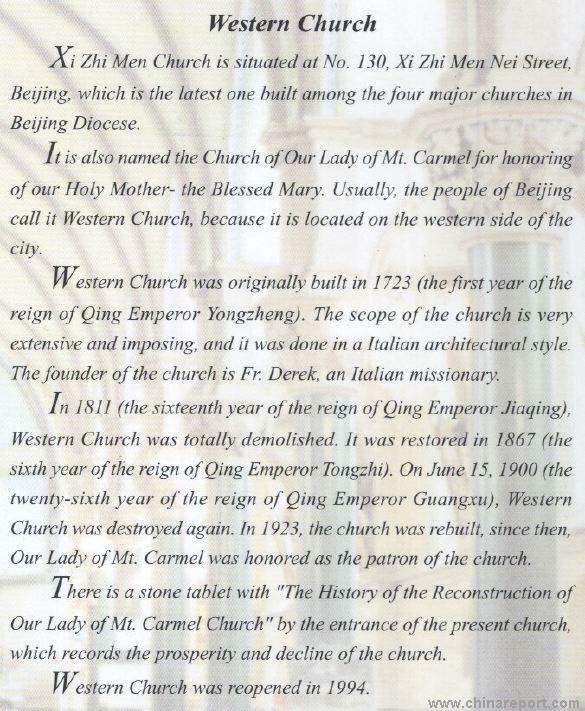 Furthermore, all Church lands granted in all of China were confiscated and Churches, including the 124 year old Beijing Western Cathedral (old location) were demolished. Not a stone was left and the site of hated western influence (now by the manned by lazarists after jesuit society were disbanded in 1773 AD and known as "The French Mission"), was cleared out. In another twist of history however, in 1860 AD, the Emperor XianFeng, loosing a second Opium War against the British and injoining Western Powers, was forced to make heavy concessions. Among them - a new, now forced grant to the lands of the Canshikou Western Cathedral. europeans were kept at arms length. Their western science was greatly appreciated and the subject of chinese interest, but otherwise the Europeans were seen as inferior, their attention mainly seen as tribute to the importance of "Da Ming Guo", the Great Ming China. Frontal view of the Northern Church, former Home of the Beijing Roman Catholic Diocese. 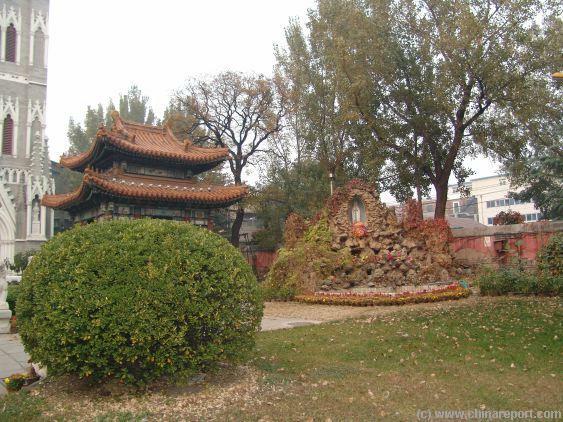 Chinese side-pavilion of the Church and a chinese rockery featuring the "Protector God" of the Diocese the Holy Mother of Jezus, Mary. their contemptuous behavior towards the Chinese and the Emperor, now protected under a new law excluding them from any Chinese Prosecution (so called "extra-territoriality"). The Church prospered once more winning many new flock over the following years. Although anti-foreign incidents and attacks on Christians would continue it was only in 1887 AD, that the Church history was once more interrupted. As mentioned, in this case the DaoGuang Emperor requested the Church move to the North-West. The Church complied with the request, gaining considerable finances and preserving Imperial Favor and International Political Stability. 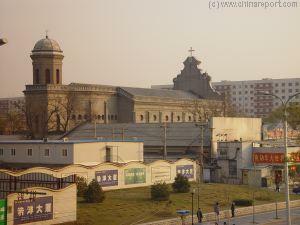 The Church was moved to XiShiKu, enlarged in ambitions, and continued to be the Center of Christian Life in Beijing. Close up of the intricate Gothic facade of the Northern Church, the largest and possibly the most Beautiful Church in Beijing. Overview of the ZhongNanHai (South Middle Lake) former Imperial Gardens now home to the Chinese Political Leadership. The Church was located somewhere on the West Bank. In 1949/1950 AD the Roman Catholic Church had a fall out with the Peoples Republic of China over the issue of the recognition of Taiwan by the Roman Catholic Vatican and alledged treatment of Christians in China. After this severe dent in relations the Churches of China fell silent and in 1958, at the beginning of the Cultural Revolution, the Churches were finally closed. The Catholic Church especially suffered during the Cultural Revolution Era (1966-76) during which normal religious activities in China had been suspended. Although a main item in the official chinese constitution of 1949 AD as well as in the founding principles of the Communist Party, in practice the chinese people's religious freedom was not guaranteed until late 1970s when Mao Zedong died and China started its reform and opening up drive under Deng XiaoPing, the new Leader. Issues remain on the table untill today, however the earlier Dogmatist views, not only derived from communism but equally by bitter experiences with the west in the past, have been tempered. A lot changed with Chairman Mao's Death in 1976. General religious freedom and personal liberties in China have improved eversince. As one late result, since Christmas Day of the year 1985 (December 25Th) the Northern Church and other Beijing Churches have been reopened and now regularly hold masses. Clergy from the Roman School regularly visit the Northern Church and other churches around the City. Relations have been on the upslope, but are still not exactly swell. 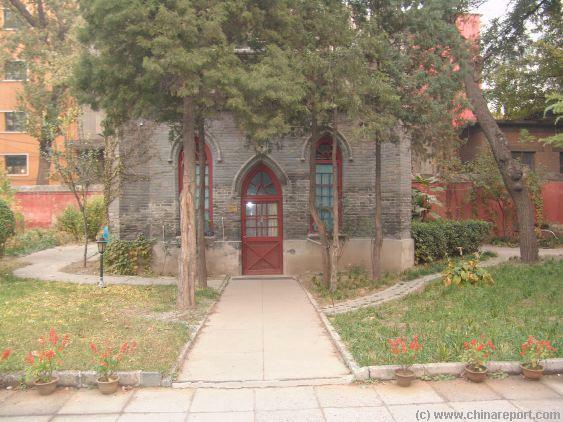 In 1990 AD the Northern Church was listed as a historical relic by the City of Beijing. For the occasion the Church was cleaned repaired and refurbished. 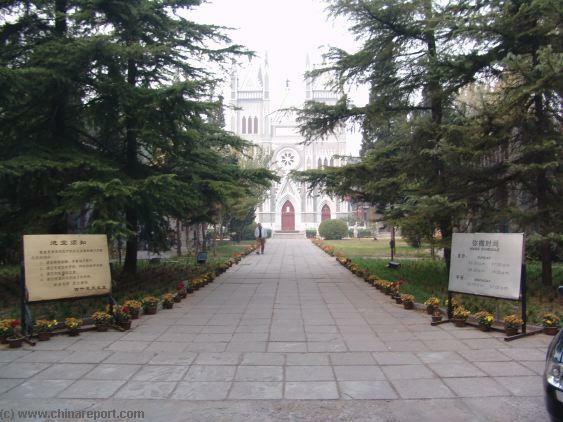 Between the year 1887 AD and 1958 AD The Northern Church was the Home of the Roman Catholic Diocese of Beijing. In that time it was the most important Christian Religious Site in the Capital and the working place of many dedicated Bishops and Clergy. The Church is still the caretaker of the Foster Children's Home, which can be viewed on site. 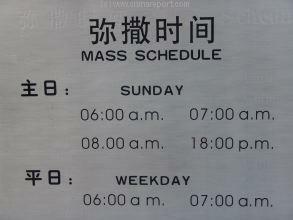 Anyone is respectfully welcome to visit at any Time during daylight hours and warmly welcomed to join in an English- or Chinese language Mass. out once more. The YiHoChuan Rebels, with secret support of the Evil Empress-Dowager Cixi, launched what would become known as the "Boxer War" (YiHoTuan Rebellion). Violence aimed mainly at westerners but also the Ching Dynasty itself broke out throughout China, quickly sweeping towards the Capital of Beijing. 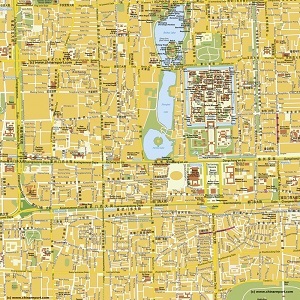 In Beijing Foreigners retreated into their Foreign Legation Quarter (East of TiananMen Square), or when they could not reach the safety of the Legations, sought refuge inside the large grounds of the Northern Cathedral. In the events following, the Church was besieged for quite a long time while western regugees, many Christian Missionaries and their families, feared for their lives inside the compound during the ongoing street-fighting (Interestingly, the Taiping principles were founded on semi-christian ideas directly derived from missionary teachings). In the end, the defenders held out against overwhelming numbers by the use of their fire-arms. Once more, the force of gunpower proved to much for the Chinese , industrial era warfare being no match for the ill equipped Boxers. When the smoke cleared and western armies had relieved, then pillaged the Forbidden City and Beijing, the Northern Church remained standing but heavily damaged. Thus, a fresh round of Church Building could begin. The current facade dates from the repairs made immediatly after, in 1901 and 1902 AD, when western powers were reestablishing dominance over recalcitrant China. More interesting Times were to befall the Northern Church. between 1958 AD and 1966 AD. However, in 1986, with the coming of the "opening up"-policy of China towards the outside world religious freedoms have been increased. 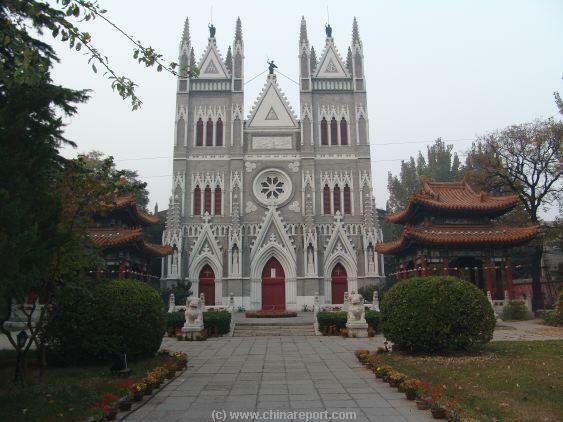 Buddhist and Daoist Temples, but also Catholic Churches have been blossoming. As one of the first widely publicized signs of this new era, the Convent of St. Joseph was reestablished in 1986 and now has over 50 Nuns in function. As mentioned above the history of the current Northern Church has been long and rather complicated. As a result of this there is a rather long list of alternative names for the Northern Church, which can be rather confusing. The first original name of the Church is Church of the Holy Savior. However, because of its magnificence and Glory the site was soon dubbed Western Cathedral and both names could be used. This situation remained untill the Jesuit Order (Society) wad disbanded on orders of the Pope in the year 1773 AD. After this the Beijing See, far overseas, remained empty for a while, but soon (1890 AD) the French Lazarists would descend on Beijing to work the new and fertile field. As a consequence, by the year 1900 AD, the Church was known as "The French Mission". After 1949 AD, the Church was taken over by the Patriotic Church of China, which refers to the communist party of China rather than the Vatican for guidance. Eversince the official name of the Church in english has been Northern Church or North Church. However, this is not all. Because the Church is not really located due North in the City, local chinese citizens know the Church as the Western Church. When asking directions, do not be fooled and use this term. It is smarter to refer to the sought site as XiShiKu, as this is the city sub-district where the Church stands. If this doesn't work, you could try Canshikou Church, another name sometimes used. To add a final complication to the name quest, there is actually another western Church. 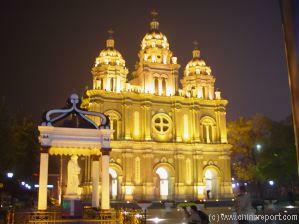 This Church in fact truly is located in the West of the City at XiZhiMen Nei Dajie. That is inside the Former West Gate, Xizhi Men. Discover Beijing with the grandiose and interesting film "Bodacious Beijing". Great intro to the City and Sites ! 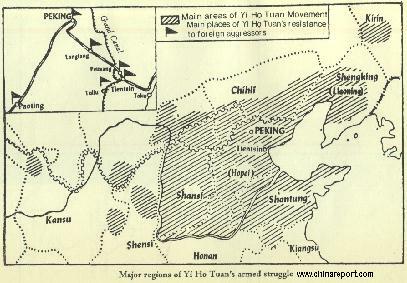 Schematic Overview Map of the Area's of North-East China swept by the anti-foreign and anti-Ching Yi Ho Tuan "Boxer" Rebellion of 1900 AD. An Alied Army with participants from 8 countries joined in the punishment expedition that struck Beijing in the process. token of gratitude towards the Jesuit scientist-Priests who cured the Emperor from Malaria with their western medicine. Within 4 years a magnificent Church was built, including an Astronomical Observatory and a Library. The Church was dedicated on December 9Th of the year 1703 AD and given named "The Church of the Holy Savior". The Church was Christened by Father Grimaldi in his function as "Visitator" and the First mass was spoken by Father Gerbillion. 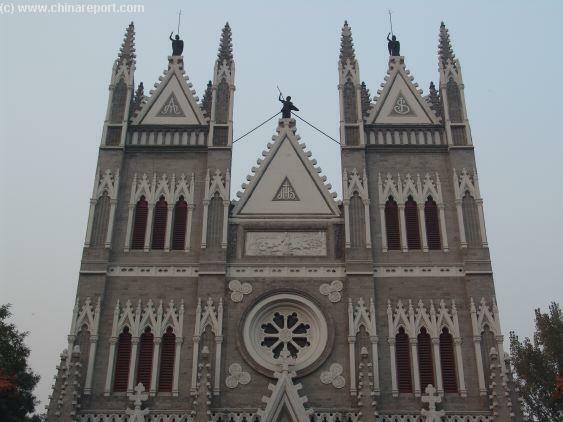 While the new Church was considered to be the "French Church", the Jesuits, who had previously held monopoly on contacts with China grumbled and carried on in their native Church, the South Cathedral (Nan Tang) at Xuanwumen. Although under the Kangxi Emperor Christianity had been tolerated at and around Court in Beijing, it was tolerated and not seriously encouraged. On the contrary, in 1669 AD, regardless of the efforts of the Jesuits to gain understanding with the Emperor and through him the Chinese, an Imperial Edict was issued banning the preaching of Christianity and the making of Conversions. Only through the mediation of the highly placed Verbiest, who by then had also become the Chairman of the Board of Communications to the Emperor and so had his ear, the effective prosecution of Christians for the violation of this edict did not take place. Although there were exceptions, such as in Zhejiang Province in 1689. In 1692 the Emperor did issue a new edict, which seemed to be friendly towards Christianity (by not sending the missionaries home), however spreading Christianity remained outlawed in the Empire and the Jesuits were always walking a thin line. At the end of the 17th Century, after the death of Ferdinand Verbiest, the balance would shift against Christianity, as Government control of society and religion increased sharply. Nationalist disputes between Portuguese missionaries and their newly arriving French counterparts exposed the more earthly aspects of the western Church to the Chinese Emperor Kangxi with due loss of respect. 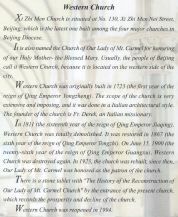 Further aggravation was caused by the arrival of Papal Orders that Christian missionaries must force Chinese converts to break with traditional Chinese rites regarding ancestor worship, a view that the Jesuits had long advised against but which had been forced through by the purists and political in the self-righteous Vatican in "Eternal City" of Rome. A Further Papal Edict, issued on 20 November of 1704 reinforced this new policy line by calling the worship of Confucius and the worship of ancestors heresy. 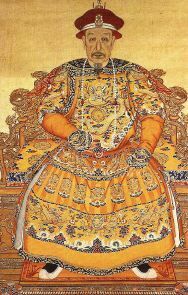 At the Manchu Court this was taken as a grave insult as according to Chinese traditions the Emperor is the great father of the Nation and not to practice ancestor worship was alike not recognizing the ultimate Father as the overlord. In other words, this undermined the respect due to the Emperor and was unacceptable. Shortly after receiving these words from Rome, the Kangxi Emperor ordered that the Imperial Plaque honoring the Church, had to be taken down immediately. It was never returned to the Church. In the year 1717, just before his death, Kangxi banned Christianity altogether and missionaries without a permit were deported from the Empire. Although Christian missionaries would stay on working for the court for the better part of the 17th Century, altogether tolerance for Christianity would end with the Life of Emperor Kangxi in 1722 AD. During the reign of the next Emperor, Yongzheng -an evil despot marked for his talents in efficiency- paranoia would live, and in this situation a full persecution of Christianity arose. In the year 1732 the Yongzheng Emperor further imposed restrictions on practice of Christianity by banning all missionaries from residing within his realm, having them deported via Guangzhou (Canton) and Macao.